Posh Play: Celebrating National Cupcake Day. 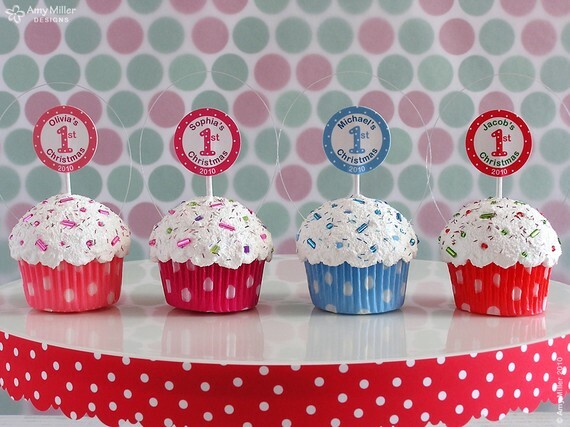 Adorable Mini Cupcake Ornaments. Celebrating National Cupcake Day. Adorable Mini Cupcake Ornaments. I go through Etsy kicks. I am on one now. I have been stalking different Etsy sellers daily this past week and ordering up a storm. I just love supporting artists doing it on their own and you can find the most unique hard to find things. Today's kick...Baby's 1st Christmas Mini Cupcake Ornaments from Amy Miller Designs. Pure cuteness. I think I need one of these for Baby Posh Play. What do you think? 3 comments on "Celebrating National Cupcake Day. Adorable Mini Cupcake Ornaments." those are soooooo cute!! i'm sure to stay off etsy or i get addicted to looking at quilts. a little more pricey than those ornaments so i always force myself to say "no" but it takes some convincing in my mind! Thanks so much for featuring my cupcake ornaments! Happy Holidays! !